Joint pain is a common problem and people suffer from this problem after a certain age. Joint pain may occur due to degenerative diseases such as arthritis, gout, etc. Women are more affected than men because there is deficiency of calcium in the bones which may cause joint pains. In arthritis, joints become red and swollen. There is inflammation of the joints and it causes pain on movement. Arthritis is an auto immune disease and it may occur in people suffering from low immunity. There are many factors that increase the risk of developing arthritis or joint pains. Natural remedies for joint pain give relief from joint pains naturally. There are many herbal remedies for the treatment of joint pains. 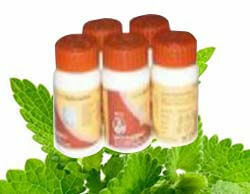 Herbal remedies are safe and do not produce any adverse effects. People suffering from arthritis or other joint problems can get relief by changing diet and lifestyle. In conventional remedies, there is no permanent cure for this problem. Conventional remedies may produce many side effects when taken regularly. Conventional remedies only give relief from superficial pain and do not cure the disease from its root causes. Herbal remedies provide nutrition to the joints and help in the permanent cure of the problem. There are large numbers of herbal remedies available in health stores and it is very difficult for a person to choose the best product for the treatment of joint pains naturally. There is swelling and redness of the joints. Pain increases on mobility. There is excessive inflammation of the joints. Sometimes, it becomes difficult to touch the painful joints as it causes too much pain. Fever is also present which indicates inflammation. People have joint pain may experience weakness in the whole body. Patient is restless and cannot move the body parts too much due to pain. There is discomfort all over the body and patient does not want to lie on the bed. The main cause of joint pain is inflammatory diseases of the joints such as arthritis and gout. It may also occur due to increased intake of proteins that increases the level of uric acid. Excess of uric acid in the blood indicates joint problems. Sometimes joint pain may be transmitted from parents to children. In women, joint pains may occur due to loss of calcium from the bones. There is degeneration of the bones and bones become weak which may result in pain in the joints. Hormonal changes that occur in women during menopause can also result in pain in the joints. Divya Peedantak Kvath: This is a wonderful herbal remedy to get relief from joint pain. It provides nutrition to the joints and gives relief from swelling and inflammation. Divya Swarnmaksika Bhasma: This is a natural bhasm obtained from a useful metal naturally. It reduces pain and stiffness quickly and helps in quick movement of the joints without producing any pain. Divya Praval Pishti: This is another useful natural remedy for joint pain and arthritis. It is the best natural supplements for arthritis. This is a useful herbal medicine for arthritis; therefore it must be taken regularly to get relief. Divya Chandraprabha vati: It is a time tested herbal remedy that has been used since ages for the treatment of any kind of joint problems. It reduces swelling and boost up the immunity to give relief. It prevents further attacks of joint pains. Divya Yograj guggulu: This is a wonderful herbal medicine for arthritis. It reduces stiffness and pain in joints. It must be taken every day to get permanent relief from joint pain. It provides relief from other bone problems as well. Divya Mahavat Vidhwamnsan Rasa: This is also a unique herbal medicine for arthritis and other joint problems. It provides nutrition to the joints and reduces stiffness and swelling of the joints. People suffering from joint pains should add ginger to their food. Ginger is known for its anti-inflammatory properties. It gives relief from joint pains as it boosts up immunity and prevents inflammation of the joints. You can add turmeric powder in mustard oil to make a paste. Apply this paste on the affects joints and tie it with a cloth. Do not move your joints for one or two hours. It will give you quick relief from pain and stiffness of the joints. Garlic also helps in the treatment of joint pains. You may eat one or two cloves of garlic in the morning with a glass of warm water every day to get relief from joint pains. It reduces swelling and boosts up the immune system. Massage your joints with eucalyptus oil or mustard oil regularly to get relief from pain and swelling. It helps in proper circulation of the blood and reduces inflammation. Drink cinnamon tea two times in a day to get relief from joint pains. You can also add cinnamon powder in your food to get benefit.